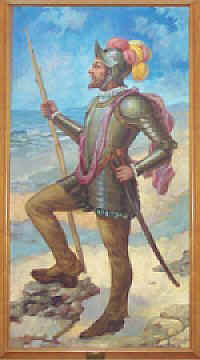 Bartolomé de Montoya, a Spanish Conquistador, arrived in New Mexico on 24 Dec. 1600. A conquistador is a term used for a soldier or an explorer. The conquistadors in the Americas were more volunteer militia than an actual organized military. They very often were required to supply their own materials, weapons and horses. Bartolomé was described in census records as being short in stature, black bearded and 28 years old in December of 1600. He arrived in San Gabriel del Yunque with his wife Maria de Zamora (born in Mexico City at San Sebastian, the daughter of Pedro de Zamora (Mayor of Oaxaca, Mexico)). With the couple were their children: Francisco, Diego, José, Lucia and Petonia. The family came as part of the second Onaté expedition, whose colony consisted of 65 settlers. The Montoya family brought with them 25 servants, cattle and equipment needed to start a new life in Nuevo España. Bartolomé was a Spanish Loyalist who settled and remained in New Mexico. He was a native of Cantillana, Spain, the son of Francisco de Montoya. From the family of Bartolomé de Montoya the Montoya surname was firmly established in New Mexico – and virtually all Montoya families from New Mexico descend from him. You’ve written a very nice condensed biography. Found you by searching for San Gabriel del Yungue in connection with Bartolome Montoya. I am a10th great-granddaughter of Bartolome Montoya. Hi Debi – thanks for stopping by! Wow…..ten generations. I am having a very difficult time getting past my great great grandfather. I think I know…but can’t prove it just yet. Frustrating! Any advice on researchng New Mexico church records? That seems to be key. This is the web site of the Hispanic Genealogical Research Center which I recently found and which has allowed me to trace my Hispanic ancestors. Until last year, I didn’t know my great-grandmother was of Hispanic descent. This website has documentation from many church records and Spanish government records. It’s a treasure. I also just enter whatever I’m currently looking for into a search engine, usually google and just like I found your blog, I often find what I need. And like you, I especially enjoy learning about the places and events that my ancestors lived and lived through. Good Luck and Happy Hunting. p.s. I was lucky enough to be born when I had 6 great-grandparents living and I quizzed them constantly about what life was like when they were young and I heard many (sometimes hair-raising) tales of my ancestors from them. Debi – thanks for this tip…I’ll go check it out. Thanks! One last request, can I quote you in my family tree on ancestry.com? Not a problem. 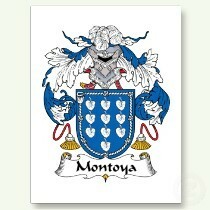 You can also go to http://www.curbowfamily.com and look at my Montoya family to see if we have a connection somewhere. Most of mine were from Rio Arriba County. Hi Judy. I am Gene DeHerrera. I am the son of Ester Lujan, the daughter of Lucas Lujan, and Reveca Montoya of Canones, New Mexico. I am also the great grandson of Edibujen Abeyta, and Antonia Garcia, of New Mexico. On my father’s side I am a decendant of Luciano Herrera of Chamita, Estanislada Dominquez of Abiquiu, and the Chacon family of Abiquiu. Our family is of mixed heritage. Of course of Spanish descent with marriages to Tewa, Cochiti, and Navajo indian blood mixed in. We call ourselves the descendants of the Genizaro’s of Abiquiu. I would love to invite you to my family tree with ancestry.com as some of the names you mention tie right into my ancestry. Keep in touch cuz!! This isn’t a family that I’ve done much research on. My grandfather’s first wife was a Lujan from Rio Arriba County, New Mexico. I am assuming that they are one of the founding families of New Mexico and have been there for generations. I presume that they would appear in the book, Origins of New Mexico families……and they probably came from Spain. Hi my name is nicholas ortega and i am the great grandson of david montoya and the grandson of david`s doughter madeline. I live in salt lake city utah, i live just a few blocks from him and i acually showed him thiz website and all of the pictures u have of him and his family and he thought it was really cool and he rembers who you are and would love to get in tuch with you so if there is any way he can get a hold of you that would be really be nice he would like that alot ! ps: I am onl y14 years old and i really eprecuate you putting this stuff on the internet ! i really think it is cool knowing about my family. My Grandfather Alejandro Montoya was born in 1873, Tularosa, New Mexico, Do have any information about Montoya’s in that area ? I have also send you an e mail requesting your help. Hi Judy, I am a Montoya and related to many Montoyas in New Mexico. I really enjoyed your blog. My father was Felipe Montoya Fajardo and his mother’s maiden name was Montoya. Judy, My name is Henry Montoya. My Father was Ray Montoya and my Grandpa was Frank (Francisco) Montoya. I know my father was born in Cleveland, N.M. and my grandpa moved to Ut. (no sure when) I also know that my family does trace back to Bartolome Montoya. But I don’t know anything in between. Do you have any info that would help in my family search. Judy, I have been doing research on the Montoya’s for about five years. I was a nosy little girl growing up and very curious. I always wanted to know about my ancestry. What’s strange is that my father and mother were both Montoya’s. They always figured that they weren’t related because he was from San Pedro, NM (Socorro County), and she was from Madrid, NM (Santa Fe, County). Her father, Luis Montoya, was born in La Jolla, (present-day Velarde) New Mexico, Rio Arriba County. Montoya I. My father descends from Capitan Antonio Montoya, and my mother from Diego Montoya II. Once I started putting the information together, it started falling into place. What is so great is that Diego Montoya was an encomendero and that encomienda (land grant) is still in my family. It was an encomiendo by the San Pedro native Americans, which as far as I know do not exist any more. It is quite big and sits on the bosque. I would also like your permission to quote some of your work. I will be willing to answer anyone’s questions, if I have the info. g,montoya46@yahoo.com Thanks for your patience. Judy, my grandfather’s name was Jose Luis Montoya. He worked on the railroad and traveled up and down northern NM. I’m still researching his side of the of the Montoya’s. I was busy researching my paternal side of the Montoya’s, which I am pretty satisfied with….I will contact you when I have more info on the northern NM Montoya’s. May I please use your info for my tree? You are more than welcome to use mine. MORE TO COME!!!! Jose Miguel & Maria Isabel Archuleta and Jose Luis & Catalina Dimas; Hortencia (my mother) & Florentino (my father); my siblings and I. Let me know what you find out as you move along. I don’t have any of the more recent names in my database…..I have no idea how we are connected. Will do…….good luck to both of us!! I am researching my wife’s family of Montoyas from New Mexico. Her great grand father Ursulo Montoya ( 31 Oct 1883 in NM – abt 1942 – Cleveland, Mora, NM) He married Adelida Aragon (21 April 1888 CO – 23 March 1977 Sacramento, CA). They had three children. One one died young and is unknown. Louis Montoya Sr ( 22 Aug 1906 in NM – 11 Mar 1996 in Sacramento, CA. Eralia Montoya (2 Sep 1910 in Raton, NM – 21 Sep 1995 in Sacramento, CA). Any help or pointers to locate they information would be greatly appreciated. Cleveland, NM is farther north of Santa Fe. I believe it’s near Mora,NM. I don’t know which one of Bartolome’s children were that far north. Will let you know if I find out anything. Hello, wanted to say hi, I like this historic Biography, Thank you, Happy New Year, Sincerely, Isidro Cazares Jr.
Hi Angela – thanks for stopping by the website and for taking the time to leave me this comment. My Montoya family is only traced back to about 1850 – all from Rio Arriba County, New Mexico. I’m at a brick wall now – and it’s been slow going. It’s a wonderful surname and family history to research ! Hello. I am decidedly Anglo. I had my DNA tested through FTDNA and I continually receive match notices of connections to Hispanic people in the New Mexico area, including specifically Bartolome de Montoya. After intensive and frustrating research I found that I have one Spanish connection, from a family of Spanish Jewish converso people. They were driven out of Spain by the Inquisition about 1450 AD, went to Amsterdam, and then London. From there the family line moved to colonial Rhode Island and Virginia. My connection is to an Anthony family which came into Virginia in 1690. In England the surname was Anthony, and so I presume the Spanish surname was Antonio, although there are indications they used Mendez at times. After the expulsions from Spain in 1492, many Spanish Jews and conversos went to Mexico and then north into New Mexico around 1600. Other Hispanic surnames which have surfaced in my matches include Gallegos, Carrillo, Ortiz, Trujillo, Gutierrez, Anaya, Pereira, Herrera, Almeida, de Luna, and Andrade. I would like to trace my Antonio/Mendez family connections in Spain. Does anyone have data on Spanish connections to Antonio people before 1500? Thanks in advance. Lyn Overton, Missouri & Florida. Thank you Lyn for stopping by the blog and taking the time to leave a comment. Unfortunately I haven’t done any research on Antonio or Mendez. I Also have Gallegos, Trujillo and Herrera in my family lines. Good luck on your search! Hopefully someone else will see this comment and respond with some helpful information. My maternal grandmother Telesfora Montoya was from Las Vegas NM, her father Celso Montoya was from Tecolote NM as was his father David, any relationship out there. My Name is Ralph Montoya im 65 years old, my Father was Manuel Montoya he Transitioned 1973. From Lumberton New Mexico. does anyone connect to this info? please respond interested in my Liniage. Ralph – thanks for stopping by the blog and taking the time to leave your comment/question. Montoya is a really common name in New Mexico, and unfortunately Manuel Montoya from Lumberton does not ring a bell for me. I have about three generations out of Rio Arriba County, New Mexico. I wish I could help. Good luck on your family history search. Hello, my name is Maggie Riberal. I am assisting my husband with his research regarding his great grandmother listed as Viavano Montoya and grandmother Dolores Montoya Chavez. I believe Viavano (which could be Viaviana) was married to Raymond Montoya. All from New Mexico and Colorado area. I’ve hit a roadblock after that. Have you come across any names associated with your research. I’d be most interested in any information you’d be willing to share. Hello, I am Theresa Diana Baca Ragin I am I believe the 11th Great Granddaugher of Bartoleme de Montoya. I have managed to document my lineage back to Ana Ortiz (Pacheco) and Cristobal Baca. I would love to attach the lineage information for you to view but don’t see where I can do that. Thanks for stopping by the website and taking the time to comment; however, this is not my family line. I am sure we intersect somewhere down the line because all Montoyas in New Mexico are related somehow! My grandfather was Jose Celestino Montoya born in 1905 in Rio Arriba County, NM, and he didn’t have a brother named Manuel. My Celestino’s father was Maximiano de Herrera Montoya born in Rio Arriba County in 1871. My Celestino’s grandfather was Jose Ilario Montoya born Jemez area around 1844. I’d love to see your work so we could try to connect our families later on down the tree. Have you taken a DNA test? I will send you a private email also. Thanks again for taking the time to comment. Hahah….and then after I made this comment I realized that you were talking to one of the other commenters – Paul! Never mind! I’m Jacob Garcia my grandfather was Antonio montoya his father was Maximilian or something we just called him max.